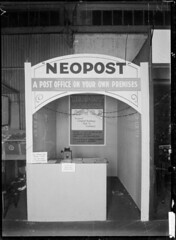 With all the new media and business to business models, had to stop and smile at this trade show display of an interior post office that companies could contract for managing mail services. Is there a lesson in here? Convenience, efficiency, and breakthrough services never go out of style when developing business-to-business marketing. Just to see, I clicked through to see the home page for a new paperless postal platform launched this past fall. Sure enough, convenience and efficiency are front and center along with the hottest motivator — paperless. Do you have any b2b advertising memorabilia to share? Post your links here. Observations are also welcome. No postage required.